Cheesy Chicken and Spinach Bundles - Made It. Ate It. Loved It. When I started to make dinner the other night this is not what I had in mind. It started as just panko crusted chicken parmesan with a side spinach salad. 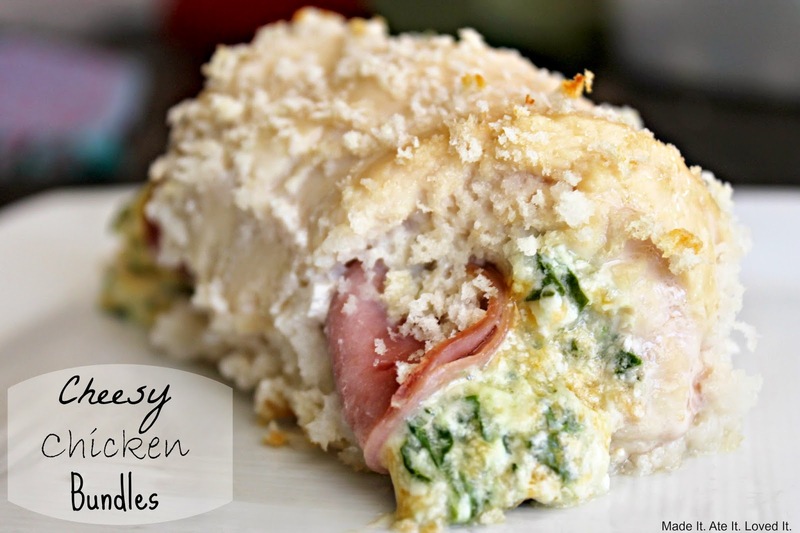 I decided to have a little fun with these chicken bundles and threw in some ham to make it a chicken cordon bleu type of dish and luckily I threw in some spinach for my kids to eat and this dish was perfect! I loved it this way but it would be good with some spaghetti sauce on top too! Heat oven to 325 degrees F. Mix cream cheese, mozzarella, parmesan, and chopped spinach together. 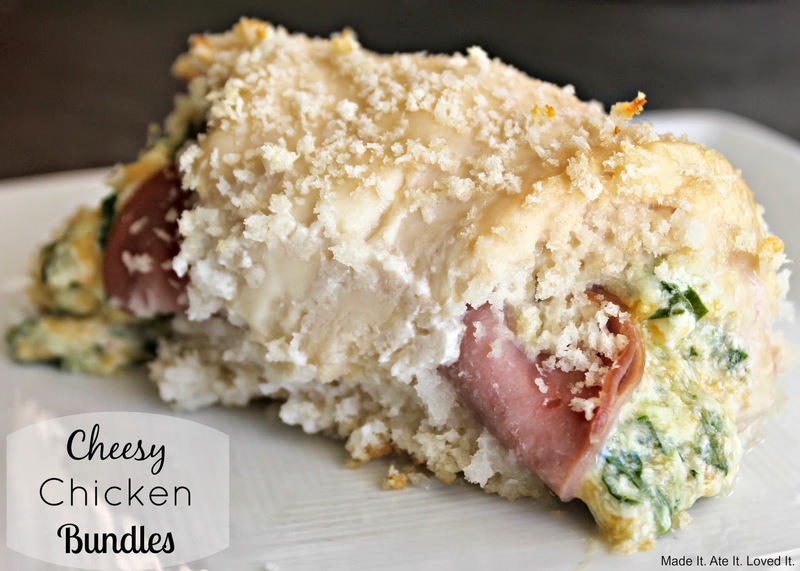 Grab a piece of chicken and place about 2 heaping Tablespoons of the cheese/spinach mixture. Continue until all chicken breast are done. Then take 2 slices of ham per chicken and place on top. Grab a baking dish and lightly spray with cooking spray. Roll up each chicken tightly and place a toothpick in. Place beaten egg in a bowl and the panko crumbs on a plate. Dip chicken in the beaten egg and then roll in panko bread crumbs. Place in a baking dish seam side down. Bake for 40 minutes or until chicken is done. Remove from oven and throw away toothpick. If you want you can serve with spaghetti sauce over top and sprinkle with more mozzarella.